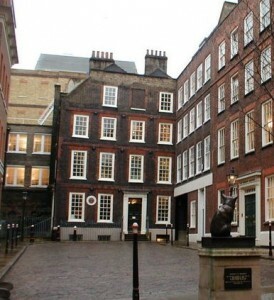 Today, Monday 10 August 2015 , an exhibition opens at Dr Johnson’s House in London to celebrate the 250th anniversary of Samuel Johnson’s edition of William Shakespeare’s works published in 1765. In the Oxford Dictionary of National Biography Johnson is described as “arguably the most distinguished man of letters in English history”. He wrote biography, essays, was a moralist and literary critic. He was one of the most noted of lexicographers, with his Dictionary, and editor of Shakespeare’s works. With the assiduous James Boswell accompanying him and writing down his saying, his life is, fortunately, well documented. 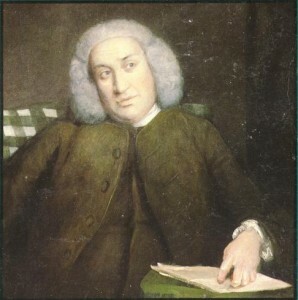 Boswell’s The Life of Johnson has been hailed as the best biography ever written. Born in 1709 in the Staffordshire town of Lichfield, Johnson was entranced by Shakespeare from childhood. In the 1740s he planned to make his name by publishing an edition of Shakespeare’s work. Probably put off by the glut of other editions being published at the time, including one by the scholarly Warburton, he shelved the idea and proposed instead compiling a dictionary of the English language as a suitably high-profile project. The Dictionary occupied him from 1747 to 1755 and having with it established a reputation as a serious writer, he returned to the idea of editing Shakespeare. His 1756 Proposals for Printing the Dramatick Works of William Shakespeare was a brilliantly thought-through exposition of what an edition should do. He intended to collate all earlier editions, to trace the sources of Shakespeare’s knowledge and to compare Shakespeare’s with the work of other great poets. 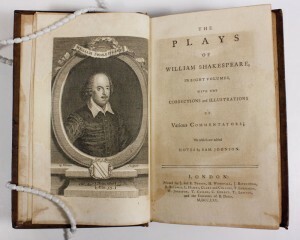 His original date of completion was, optimistically, 1757 but it was in October 1765 that The Plays of William Shakespeare, in Eight Volumes, with the Corrections and Illustrations of Various Commentators; to which are added Notes by Sam. Johnson, was published. Johnson’s work was often delayed. He wrote “Indolence, interruption, business, and pleasure, all take their turns of retardation; and every long work is lengthened by a thousand causes that can, and ten thousand that cannot be recounted. Perhaps no extensive and multifarious performance was ever effected within the term originally fixed in the undertaker’s mind”. Modern editors will appreciate how ambitious was Jonson’s undertaking especially since he intended to carry out much original research. Johnson’s edition was perhaps not a complete success: he was not a scholar of the Elizabethan period, but he was knowledgeable about the English language. He wrote “I have endeavoured to perform my task with no slight solicitude. Not a single passage in the whole work has appeared to me corrupt, which I have not endeavoured to restore; or obscure, which I have not endeavoured to illustrate. In many I have failed like others; and from many, after all my efforts, I have retreated, and confessed the repulse”. His preface is still often quoted, and this is one of the best-known sentences: “Shakespeare is above all writers, at least above all modern writers, the poet of nature; the poet that holds up to his readers a faithful mirrour of manners and of life.” In a comment to Joshua Reynolds Johnson admitted that it was writing about literature, rather than editing, that was his real forte. “There are two things which I am confident I can do very well: one is an introduction to any literary work, stating what it is to contain, and how it should be executed in the most perfect manner; the other is a conclusion showing from various causes why the execution has not been equal to what the authour promised to himself and to the public”. The edition was, none the less, received as Boswell put it “with high approbation by the publick”, was reprinted in 1773 and several times subsequently. In addition there are a number of events, beginning on Tuesday 11 August with a guided tour of the house by Fiona Ritchie entitled Women and Shakespeare in the 18th Century, that will explain how Shakespeare was read and popularised by women during the period. On Thursday 13 August there will be a round table discussion by Fiona Ritchie, Professor Robert DeMaria, Katherine Tozer, Professor Philip Smallwood and Professor Peter Sabor, sharing their expert knowledge on topics from collecting the works of Shakespeare to the 18th-century stage. Towards the end of the month performer, director and researcher Mark Howell will present Samuel Johnson & Drury Lane: The Imaginative genius of its Three-Sided Stage. He will talk about his experience of performing popular 18th-century plays at the surviving Georgian Theatre Royal in Richmond. Most Saturday afternoons there will be Tours of the Exhibition given by the curators, who really know the collection. Though some of the events are being charged for, the Exhibition is free after paying for admission to the house, and will be on until Saturday 28 November. This entry was posted in Legacy and tagged 18th century, Complete Works of Shakespeare, Dr Johnson, Dr Johnson's House, Samuel Johnson. Bookmark the permalink. This is as good an introduction to Johnson and Shakespeare anyone could expect to find: concise, and with the best explanatory references. Johnson’s statement about delays (more like procrastination in his case) applies to us all. Thanks for your kind comment Phil. The exhibition sounds fascinating. Are you going to be able to get there?